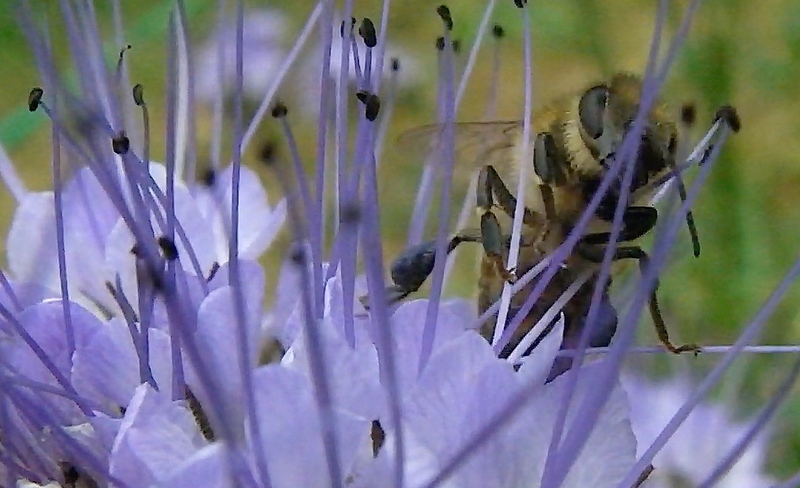 As soon as the main nectar flow quit (blackberries), the bees started working the Phacelia. It was then that I noticed the blue pollen. I can see why they preferred blackberries…these blossoms are hard to work. 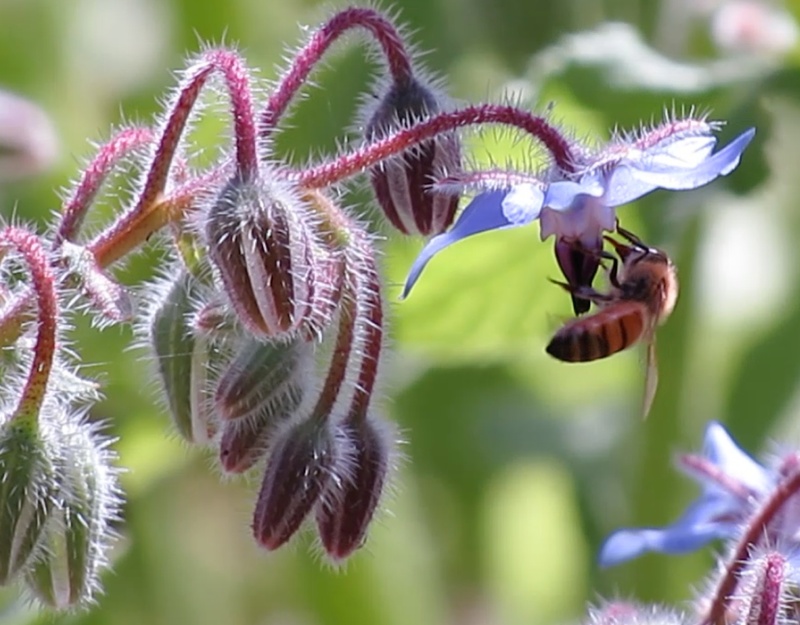 A bee works the borage in late July. A second batch of borage has reseeded itself and will hopefully bloom during autumn. 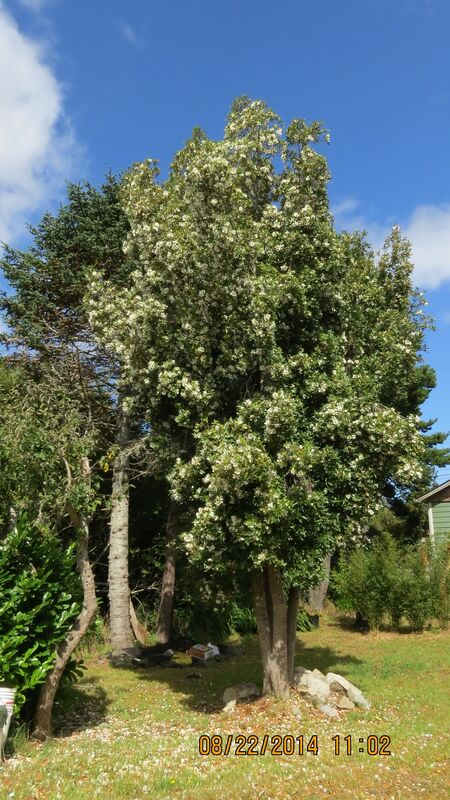 August 22, 2014…I finally visited Barbara’s Mock Orange tree. It was everything she said it was. Covered in white blossoms with bees all over it. Note: this might NOT be a Mock Orange. See below what Carol Quish of University of Connecticut had to say. August 29, 2014…When I think of summer, this is what I picture. SUNFLOWERS. Last year we had precious few. This year we grew a few more for the bees. It was hard to stay in the shop during the blue sky, bee-flying, sunny days. September 1…I’m soooo glad I planted these Autumn Joy sedums a couple of years ago. 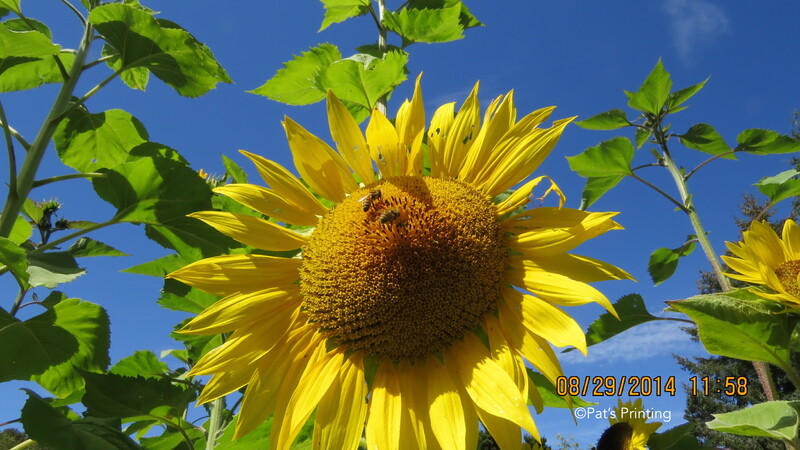 The bees get nectar from it from late August through September. How many bees do you see? It’s easier to count them in the video. 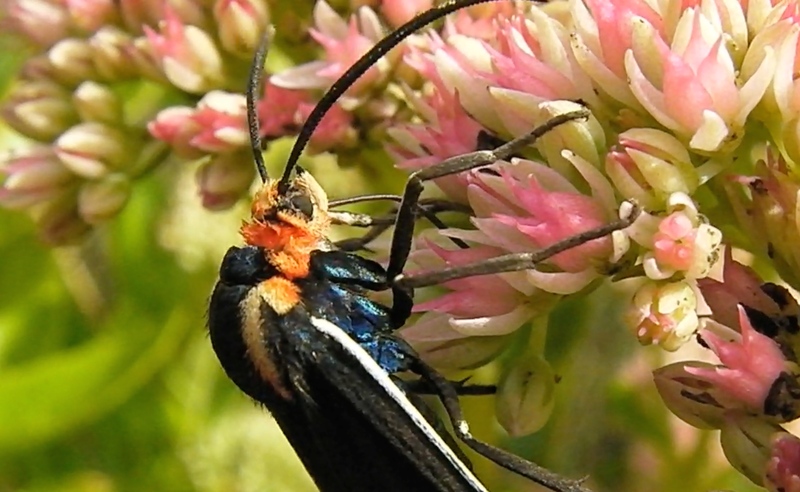 A Ctenucha Multifaria partakes of the nectar too. Your videos are soo good! I have not been successful with Phacelia but I am going to try really hard next year as I want to see the bees with blue pollen! I was very interested in the mock orange because we call Philadelphus species mock orange but I’ve never seen a Philadelphus that size. Could you confirm the Latin name? I am also interested in whether different varieties of the same species are as rich in nectar as other. My Sedums attract bees and pollinating insects but not as much as I had thought so I’m glad you mentioned the name of Autumn Joy as I am not familiar with it. I have looked for the Latin name of the mock orange tree. Still haven’t found the exact variety yet. The petals are correct, but the stamens are more numerous than any I’ve seen on google ‘images.’ I thought it might be a “scentless variety,” but Barbara just replied that it has a ‘pleasant but not overpowering scent.” None of the images of trees were even close to the size of this tree. Perhaps it is a Philadelphus species but like such a lot of things in the States – just much bigger than anywhere else! Wow! I’ve seen mock orange shrubs, but never a tree like that. That’s spectacular! I planted borage this year, but my bees completely ignored it. 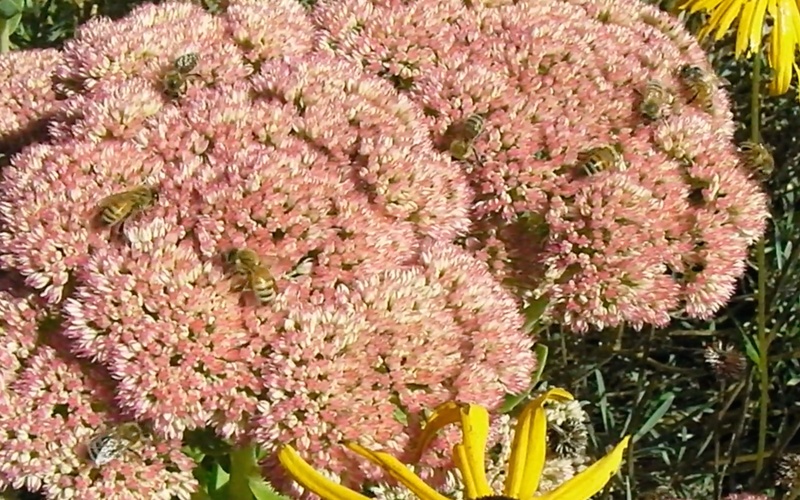 However, I also have Autumn Joy sedum, and they are all over it. Definitely a great bee plant. Excellent video, Pat! 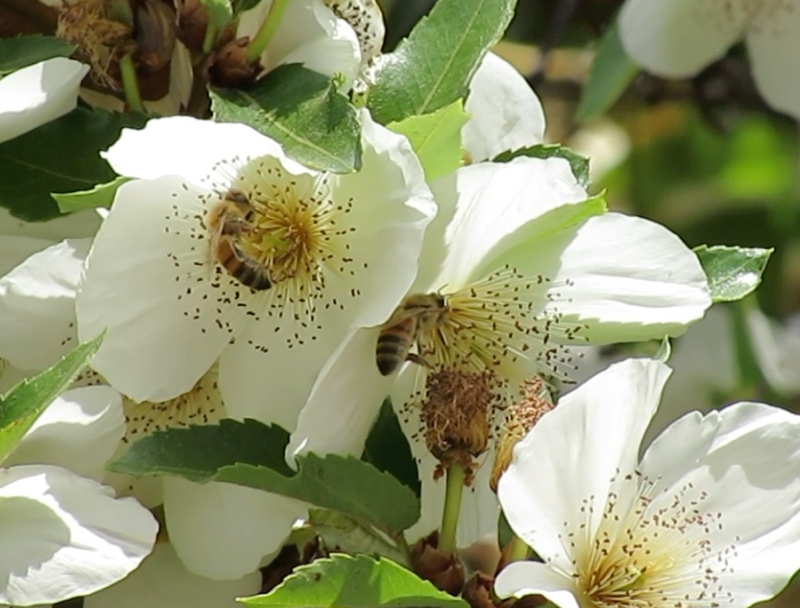 That leafcutter bee footage was great in particular. Ahhh! Megachile centuncularis is a leaf cutter! I just googled it…yup! That’s what it is.